The kids are back in the kitchen - after a few days away, they have realized that the food is better at home, especially when you make it yourself! 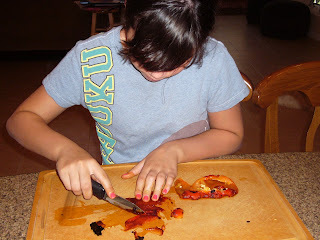 Sabrina wanted roasted peppers for her pizza tonight - so first, she blacked them on the barbecue. No point in heating up the kitchen if you can help it! 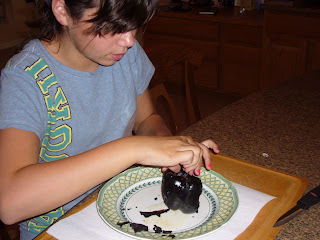 After she brought them inside, she put them in a bag to steam, so it would be easier to remove the skins. And here they are! Great job Sabrina! And the best part? They will stay in the refrigerator for several weeks - if they last that long! 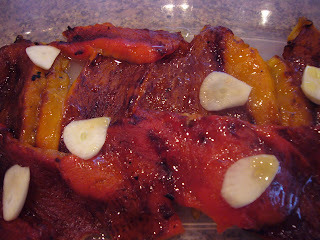 Roast peppers on barbecue until blacked on all sides. Place in ziploc bag and allow to steam for several minutes. 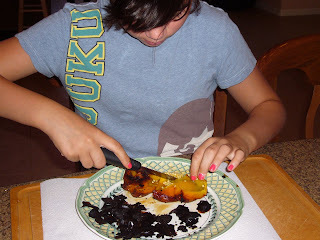 Remove blackened skin, then open pepper and remove stem and seeds. 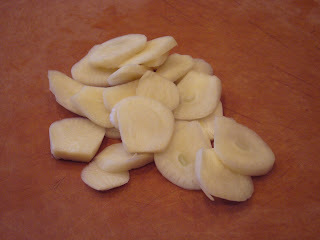 Cut into strips, and place in a medium sized container. Place garlic on top of peppers, then drizzle olive oil over the top. Cover and refrigerate until ready to use.